The purpose of Removal Orders can be seen in the notes below (taken from a variety of sources: Google search “removal orders”). It turns out that surviving copies are quite rare so it is interesting that we have one in our archive. A normal size picture is seen below with a super-size picture to help to decipher the writing. Mary, Robert, Mary and Elizabeth Bayes had tried to settle in Ellingham in October 1734 it seems, much to the consternation of the Overseers of the Poor. They could not have been here long because, if they had stayed for over forty days, they could claim residency. Can you make out where they were from and to where they were returned? The Poor Relief Act 1662 was an Act of Parliament that was supposed to help the poor to gain better help from the authorities. The Act became known as the Settlement and Removal Act. The purpose of the Act was to show the parish to which a person belonged (i.e. his/her place of "settlement"), and so clarify which parish was responsible for him should he become in need of Poor Relief (or "chargeable" to the parish poor rates). This was the first occasion when a document proving home address became statutory: these were called "settlement certificates". 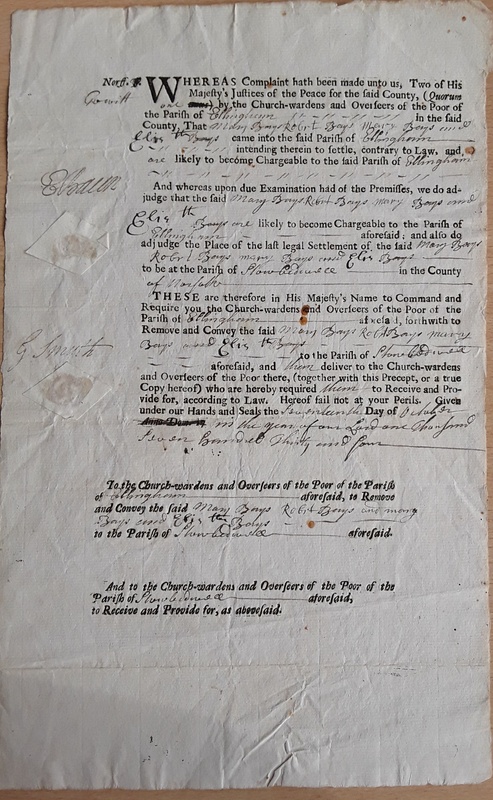 After 1662, if a man left his settled parish to move elsewhere, he had to take his “settlement certificate”, which guaranteed that his home parish would pay for his "removal" costs (from the host parish) back to his home if he needed poor relief. If the parish authorities discovered that a person was likely to become a financial burden and become chargeable to the parish such as illegitimacy cases, those taken ill, suspected illegal immigrants or vagrants, the parish authorities undertook a Settlement Examination. The examination took place under the auspices of the Overseer of the Poor and a Justice of the Peace and was carried out to determine whether the person had a legitimate right to residency in the parish. Following the findings, a guilty person would be served a Removal Order and then, forcibly if necessary, removed from the parish. These procedures were part of what is known as the Old Poor Law. The Settlement Laws benefited the owners of large estates who controlled housing. Some land owner’s demolished empty housing in order to reduce the population of their lands and prevent people from returning. It was also common to recruit labourers from neighbouring parishes so that they could easily be sacked. Magistrates could order parishes to grant poor relief. However, often the magistrates were landowners and therefore unlikely to make relief orders that would increase poor rates.